The soldiers have left Downton and life is returning to the way it was before the war-as much as it can. Many of the household are feeling restless and useless. 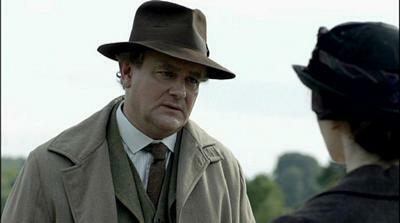 Lord Grantham is feeling as though he has no purpose and is feeling a bit lost. He runs into Jane, the new maid, and they chat about her son. Later on, he sees her again and kisses her. He invites her into his room later on, but then both decide this is not what they need and Jane decides to resign from the house and look for work elsewhere. Sarah: I was SOOO mad at Lord Grantham and his thing with Jane. I knew there had to be more to her story! I feel bad for Jane, but both are feeling a bit lost and confused right now. Also, Cora's being a bit mean, telling Lord Grantham that Matthew should leave the house and I started to dislike her a bit in this episode. Actually, she's been bugging me a bit the last few episodes-she's been so snotty lately! I am glad that Jane decided to leave-I think she made a hard decision but it was the right one and I like her a bit more for that. Melanie: Watching Lord Grantham, a character I've always admired be a villain, first against his wife then later on, Sybil, was incredibly painful. Personally, I don't think Cora was being mean. She was getting on with her life as normal as she could, but Grantham couldn't seem to find his footing and seemed to want their daily activities to go on as they were before the war- an impossibility. While I agree that her wanting Matthew to move out may seem harsh, I think she was doing it in the interest of Mary. Frankly, I think she knew what she was talking about. Cora has heard from the Bryant's who want to visit Downton because it was the last place there son was before he died in the war. Mrs. Hughes arranges for Ethel to arrive with the baby and hopes to sneak Mrs. Bryant away for a bit so she can meet her grandson. Ethel bursts in on lunch and announces that Charlie is their grandson. Mrs. Bryant believes her but Mr. Bryant wants nothing to do with the child. Later on, the Bryants write that they have had a change of heart and want to speak to Ethel again. They offer her the chance to have Charlie live with them and raise him as a gentleman and cutting her out. Ethel begs to be a nursemaid, but Mr. Bryant won't hear of it. In the end, Ethel decides she must keep her child, even if it will be difficult for them both. Sarah: Poor Ethel-she can't get a break. I do wish Mr. Bryant wouldn't have been so stuffy, but Mrs. Bryant has a heart. I wonder if we'll see her again and if she'll try to help Ethel out. Melanie: I predict Mrs. Bryant will sneak away to see Charlie. It's obvious she wants to be a part of Charlie's life. Sarah: Agreed. I think she'll be back. Matthew confides in Bates that he has felt a tingling in his legs, although the doctor thinks it's just his imagination. He doesn't tell anyone and tries not to get his hopes up. One evening, he reflexivly stands from his chair to help Lavinia who has tripped and the secret is out-Matthew is regaining feeling in his legs. 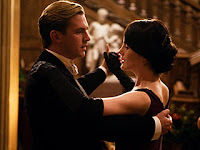 Matthew and Lavinia decide to move their wedding up and hope to marry at Downton. This means Richard and Mary's wedding will be delayed until the summer. As Mary hears the news about Matthew and Lavinia's wedding, she tries to hide her disappointment, but Violet notices. She approaches Matthew and tells him that Mary is still in love with him and could he love her in return? Matthew says that he couldn't turn Lavinia away after she stood by him even when there was no hope. Melanie: I was a bit irritated when Lord Grantham simply agreed to Matthew and Lavinia marrying at Downton at the time of their choosing without at least consulting Mary first. After all, she is his daughter! Sarah: I loved that Violet went and talked to Matthew! She was so funny and it's so obvious both of them really care for each other. Will they ever be able to be together?? The agony!! Sir Richard asks Anna to spy on Mary for him and report back to him about where Mary has been and who she talks to. He offers to pay Anna nicely, but Anna refuses. She reports this to Carson and Mrs. Hughes. Carson decides he cannot work for a man that would ask such a thing and turns down the offer to go with Mary and Richard to Haxby when they are married. Melanie: At first I thought Richard was trying to be nice. I thought maybe he wanted to know Mary's favorite type of flower, or what she liked to do. But no. He was trying to be an obsessive control freak. Sarah: Obsessive control freak is right! Richard is so evil! Now he wants to spy on Mary? The guy is horrible ball of jealously and he will stop at nothing to get his way. Even though Mary isn't thrilled with Richard, she's not been unfaithful to him and I think she has acted the best she can. She has spent time with Richard and she's loyal to him. She cares for Matthew, but she's not trying to stop his wedding. Richard is crazy with jealousy! 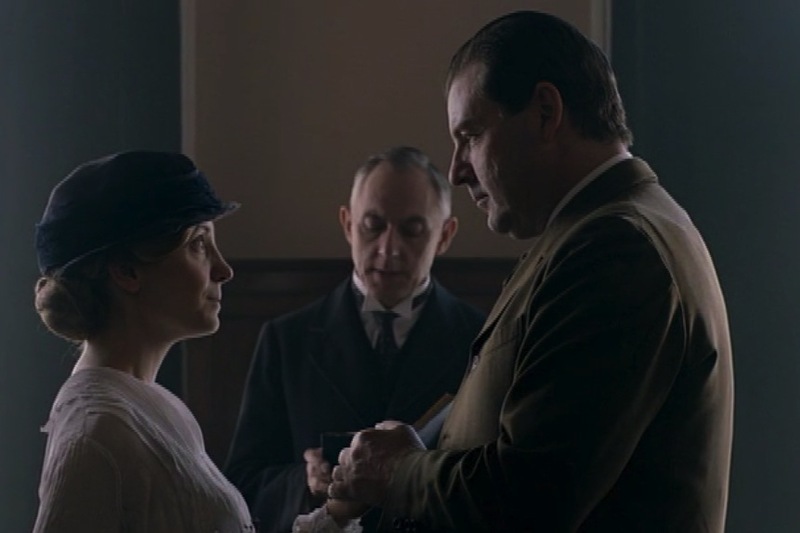 Bates is concerned that he will be suspected in the death of Vera Bates. He confides in Anna that he had bought rat poison at Vera's request and he believes that is what killed her. Anna urges him to tell the police but Bates refuses to say anything. He also shows Anna a letter that Vera wrote to a friend saying she feared for her life. All evidence points to Bates, but Anna says she will stand by him and that she will do that as his wife. They move their wedding date up and marry. Mary helps set up a room for them and the two are able to spend a night together as husband and wife. Sarah: I'm so happy they are finally together, even under dark circumstances. 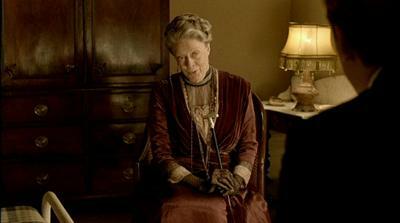 I still think there's something up with O'Brien-she seemed very curious about all the news about Mrs. Bates. But I also wonder if Vera did it all herself and framed Bates because she knew what it would look like. When Mary showed Anna the room that she had for them, it was so sweet and such a lovely moment for Bates and Anna. I worry for what they have in store-things will not be easy for them. Melanie: All I can say is, Bates better be innocent. (Sarah: Agreed!!) Anna has given up a lot for him and will have to struggle to stay strong through the coming time. Sybil is not happy to return to the way life was before the war. She tells Branson she has made her decision and will come away with him. Sybil does not show to dinner and Mary discovers that Sybil has run away. Edith and Mary decide to go after her and find Branson and Sybil in a local inn (just sleeping, he is a gentleman after all!) They convince Sybil to return home with them although Sybil says her feelings will not be swayed. Later, they decide to tell the family, which does not go over well. Lord Grantham is upset with Sybil and refuses to give his blessing. He even meets up with Branson at the inn and tries to pay him off. Sybil announces that she will be leaving after Matthew and Lavinia's wedding to go to Dublin where Branson has gotten a job as a journalist. She will go with or without her families blessing. Later Lord Grantham gives in and says they can have his blessing and be married. Sarah: I'm so glad Sybil and Branson are finally together after all that! Also, I love that he's such a sweet guy-it was so cute to see him sleeping in the chair next to Sybil in the inn. I did think it was hypocritical of Lord Grantham to get all upset about Sybil when he's been off making out with the maid, but no one can know about that right? Melanie: You know, I kind of think that Carson knows about Grantham making out with the maid. His overly loud silverware clatter when Grantham and Jane were talking in the dining room? Not an accident. Sarah: Ooh...good point. I think he knows something too. Melanie: But I'm very happy about Sybil and Branson as well. I haven't been completely fond of Branson this season, but watching him stand by Sybil throughout her fight with her father made me proud of him. Also, during this episode I just figured out his name was Tom. And I was proud of Sybil as well. She got into an argument with her father while Violet was watching/refereeing and stood her ground! As the house is being readied for Matthew and Lavinia's wedding, many of the household are feeling ill. Spanish Flu arrives and Carson, Cora and Lavinia all are stricken with the illness. Lavinia seems to be doing well and Cora has taken a turn for the worse. Matthew and Mary share a moment as they are dancing and end up kissing. Lavinia had risen from her bed and witnessed the whole thing. She tries to tell Matthew that they should call off the wedding, that she's not the one he's supposed to be with. She then starts to grow ill again and the disease ends up taking her life. Matthew believes that Lavinia died of a broken heart because of what she saw between Matthew and Mary and he tells Mary at her funeral that they can not be together. Cora ends up taking a turn for the better and both Cora and Carson recover from the flu. Sarah: Not Lavinia!! I was starting to kind of like her and I just wanted her out of the way so Matthew and Mary could be together, not dead! I thought it was a bit convenient of the writers to have Lavinia die. Matthew knows how horrible Richard is-he can't let Mary marry him-there's no way! Melanie: I'm pretty sure everyone who wished Lavinia would just go away now feels horrendously guilty. Melanie: It all happened so fast, but I suppose that's the way the Spanish Influenza happened.And even though I didn't approve of how far Mary and Matthew's "talk" went, I think it was one they sorely needed to have. "We were a show that flopped" - That line was heartbreaking. After Lavinia's funeral, the staff make it back to the house only to discover policemen there to take Mr. Bates away for the murder of Vera Bates. Sarah: I'm not convinced Bates did it at all. I'm sticking by my original theory that O'Brien had something to do with it. Not sure why I think that, I just do. Melanie: I think Richard had something to do with it. Perhaps Vera attempted to take Mary's story to another paper?I can't wait for next week's episode! Even though it'll mean the end of season two. Did you see that punch Matthew laid on someone? It happened so fast, I couldn't tell who it was, but I'm sure we'll find out next week! I am loving this show! Next week is the last episode of the season, but I know they are in process for season 3! "I'm pretty sure everyone who wished Lavinia would just go away now feels horrendously guilty." That was a spot-on observation there. I'm also on pins and needles about Bates... your suspicious about O'Brien are interesting. She's been much too nice lately. "I'm pretty sure everyone who wished Lavinia would just go away now feels horrendously guilty." Including Carson! I think the way that they set up Vera's murder a few episodes ago pointed so strongly to Bates in a way that was rather clumsy. And such strong, clumsy foreshadowing is not really what Downton does, which makes me believe in his innocence all the more! So obviously a frame-up! I loved O'Brien's guilt when Cora was sick. Every so often she turns human. I also thought it was a good way to get Thomas back into the house now that the war's over. I despise him, but he's too good of a character to let go! Helen-This show is so addicting! I don't know what I'm going to do when this season is over! Christy-I'm glad you're enjoying it! Melissa-Melanie pegged it so well, didn't she? I agree-O'Brien has been way too nice. I just don't trust her. Jennie-Exactly. They don't usually foreshadow so badly-I think there's something more to that story. And I forgot to mention Thomas! He furiates me so much-he was so close to being gone and yet he somehow stays. So frustrating!! What did you think about M&M's kiss? I've gone back just to rewatch the scene. Happy squeals! I do think the show is getting increasingly soap opera-y, especially with Lavinia's convenient death. But I still love it. Alison-I was squeeing with delight!! I agree it's getting a bit soapy. I am not familiar with this show but as I read it, it is very interesting story. Wish this is watched in our place.